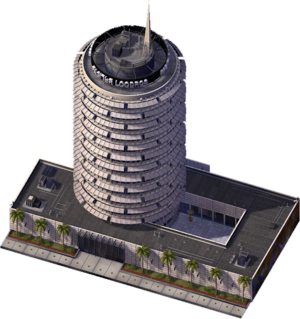 Capitol Records is a downloadable Landmark Building for SimCity 4 Rush Hour/Deluxe, released as the Plugin Pack 012 free Downloadable Content. It is a recreation of the Capitol Records Building in Los Angeles, California, built in 1956, as it appeared in 2003. This landmark has possibly the earliest rendering of written Simlish. Possibly due to trademark concerns, the name on the roof of the building doesn't read 'Capitol Records'. This page was last modified on 5 February 2014, at 23:35. This page has been accessed 8,778 times.